Wireless dual ear design, left and right ear channel separation. You can use the headset solely, or used them in pairs. BT5.0 brings high data transfer speed, stable connection and low power consumption. Auto fast pairing between left and right earbuds once taking out of the charging case. Easy and quick to pair with BT-enabled audio devices within 10 meters in open space. 50mAh battery in each headphone ensures 3-4 hours of working time. 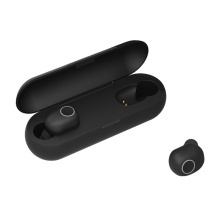 Charged automatically in the 400mAh charging box which enables headset charging for about 4 times. BT5.0 chip offers noise reduction function which enables to grasps the detail of voice. Built-in Mic on both earbuds delivers crystal clear talking sound in stereo mode. 7.5g (pair) lightweight and mini size fit well to your ear canal, comfortable to wear. With charging box, easy to store and carry anywhere. One button design, easy to control music and call. IPX4 waterproof headphone is suitable for sports, no need to worry about sweat or rain while running, cycling, hiking and more.